The story of how Berkeley, California, first got wheelchair-accessible sidewalks in the 1970s is an unlikely mix of public protest, anti-war sentiment, and the grassroots potential of urban planning for the people, by the people. Writing for Boom, Bess Williamson explains how the city began to redesign itself for everyone to navigate. A story of Disability Rights, although rarely included in accounts of the Sixties in Berkeley, runs alongside the history of protest against University of California policies, the War in Vietnam, and the establishment in general. During these tumultuous years, a community of mostly young disabled persons, many of them students or graduates of the University, left a mark not only on the politics of the city, but the physical landscape as well. From 1970 to 1974, the City built the first planned, wheelchair-accessible route in the United States. These sloping curbs—varying in design over time—created the physical foundation for one of the largest and most active communities of disabled people in America. Cover of The Independent showing Berkeley's "Wheelchair Route" designers: from right, Hale Zukas; his attendant and collaborator Eric Dibner; community organizer Kitty Cone; and an unidentified helper. COURTESY OF THE CENTER FOR INDEPENDENT LIVING. Berkeley was host to a growing populace with disabilities in the 1960s, including people with significant paralysis due to spinal cord injuries, cerebral palsy, and polio. This community centered around a small group of students who lived in a special dormitory within Cowell Hospital, the only building on the University campus that could accommodate wheelchair users. In an era before government requirements for "accessible" design, these students made their own ways through the hilly terrain of campus and city. They rumbled through town on hefty, rudimentary motorized wheelchairs, wheeling in the street or relying on friends to drag them up steps and over curbs. For these young people, the rebellious spirit of Berkeley in the Sixties was infectious. The Cowell residents banded together, lobbying for greater accessibility on campus, more housing options and their own wheelchair repair shop. By the end of the decade, recalled one student, "everything began happening at once." The campus was charged with political spirit as protesters clashed with authorities on campus and in the city. In this historical moment, Berkeley's disabled community sought a space for themselves in the broader cityscape. Center for Independent Living director Phil Draper at the corner of Telegraph Avenue and Blake Street in 1984, Going Where You Wheel on Telegraph Avenue. The first move to build curb cuts on Berkeley sidewalks came out of a coincidence of 1960s politics. In 1969, Berkeley erupted in riots over the University's plans to build on an untended lot near campus that functioned as a "People's Park." After riots that brought the National Guard to town, the City renovated the Telegraph Avenue business district, widening sidewalks in a gesture towards local street life. In keeping with a brand new building code, these renovations included wide, flat curb "ramps" positioned at the corner of the sidewalk. Curb cut diagrams by Yoshiaki Imafuku, in Going Where You Wheel on Telegraph Avenue (Berkeley, CA: Center for Independent Living, 1984). While Berkeley's wheelchair users greeted the new cuts with pleasure, they also noted concerns about accommodating a range of disabled persons. The wide, flat curve where the sidewalk flattened into the street caused problems for blind pedestrians who relied on a sharp curb to detect the edge of the sidewalk. Even for wheelchair users, the cuts' diagonal position caused a conflict with turning cars. A visiting Japanese student, himself a wheelchair user, sketched the pros and cons of various curb cut designs, showing how the curb cut that angles into the street can push wheelchair users into traffic. For a second round of curb renovations, the disabled community of Berkeley took an active design role, mapping more than 100 sites for cuts along Telegraph south of campus, and along Shattuck Avenue in downtown Berkeley. They also offered a new design: a steep, sharp cut set outside of the main pedestrian intersection. These new cuts were steep for wheelchair users, but represented a compromise for a range of pedestrian needs—foreshadowing the "universal" ideal of later planning and design projects. Berkeley's Wheelchair Route, drafted by Ruth Grimes. Dots indicate the location of 125 new curb cuts. Map from City of Berkeley, Resolution No. 45,605-N.S. (February 13, 1973). The early changes on Telegraph and the surrounding area were the first in a series of design projects to accommodate Berkeley's large disabled population. Since the 1970s, Telegraph has been renovated and resurfaced many times over. In place of the original flat "ramps" are curbs with textured concrete slabs to identify the change in surface for the blind, often marked with bright yellow inserts with bumps. Designed decades before recent projects such as the Ed Roberts Campus (see article by David Serlin), these curb cuts were low-profile, but nonetheless important elements of an accessible city. Raised curb cuts at Telegraph and Dwight avenues, 2011. Photo by Bess Williamson. 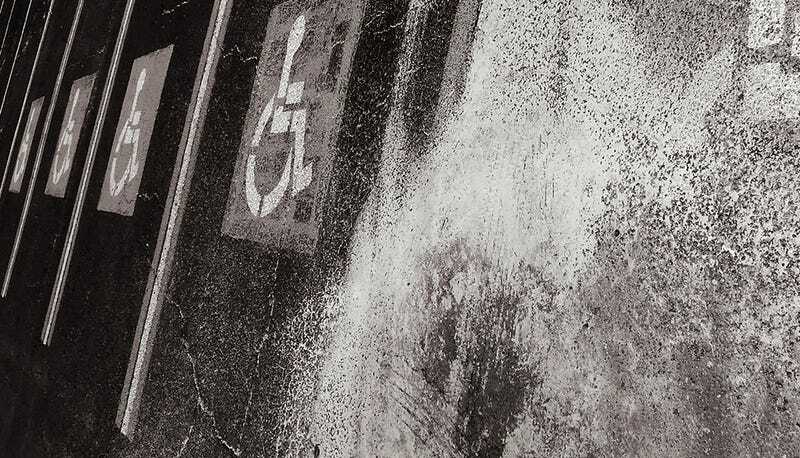 This post was originally published as "The People's Sidewalks: Designing Berkeley's Wheelchair Route, 1970-1974" in Boom. Boom: A Journal of California aims to create a lively conversation about the vital social, cultural, and political issues of our times, in California and the world beyond.